The white 4071 Omnidirectional Low-Cut, Presence Boost Microphone with Windscreen, Clip, and XLR Adapter from DPA Microphones is designed for use in performance applications to capture audio for broadcasters, TV studios, news anchors, stage plays and more. It features a 4071 omnidirectional condenser microphone with a low-cut and presence boost equalization for voice. It features a frequency range of 100Hz to 15kHz and is resistant to moisture and extreme temperature changes and humidity. The kit features a windscreen, mic clip, a microdot to XLR adapter and 2 protection grids. The 4071 mic is powered by 48V phantom power. It is built with a reinforced cable relief to withstand the constant twists, bends, pulls that are part everyday use. The kit includes 2 different protection grids which allow you to acoustically modify the microphones response. The response will vary according to the placement of each grid. 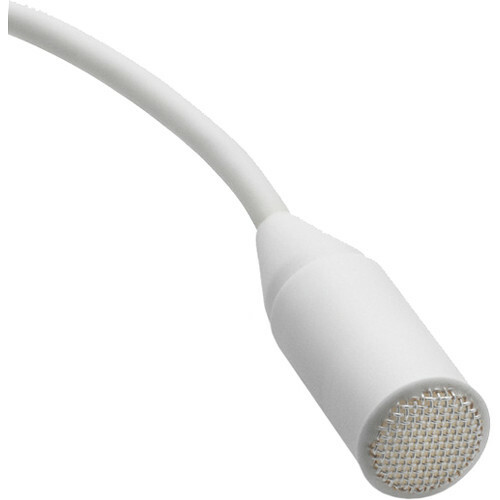 The 4071 omnidirectional miniature microphone has a low noise floor and can handle high SPLs. A MicroDot to 3-pin XLR belt clip adapter, miniature mic holder, 2 protection grids and windscreen are included. The adapter for powering miniature-microphones via standard P48 phantom power is the DAD6001. It is active signal balanced and improves suppression of induced electromagnetic noise. Common Mode Rejection Ratio (CMRR) is better than 60 dB from 50 Hz to 15 kHz. The adapter is functional at 12 V phantom power but needs 48V ± 4V to reach full specifications. The DAD6001 is designed for use with miniature-microphones from DPA only. A belt clip is included.